Superfine sugar works best as it dissolves quickly and does not produce a grainy texture. If you don't have superfine sugar, you can place regular sugar in a blender and process it for about 20 seconds to create superfine sugar. 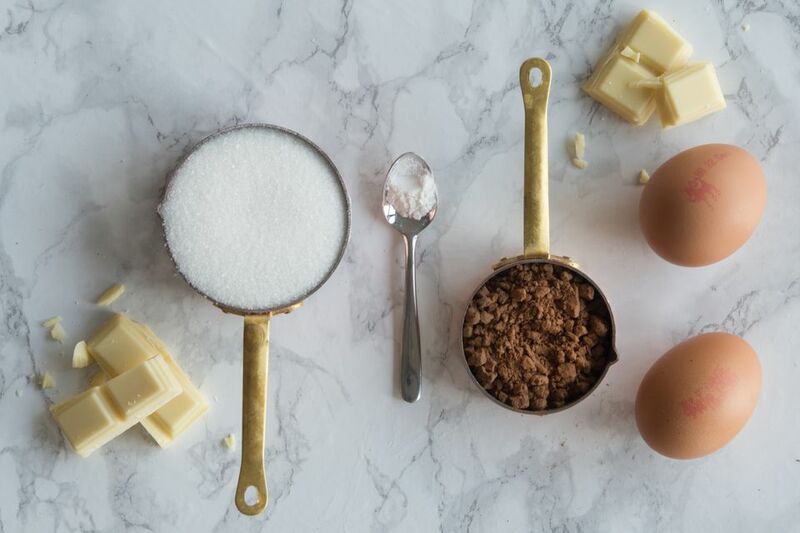 As for tools, you will need an electric mixer with a whisk attachment, two baking sheets covered with parchment paper, and a pastry bag fitted with a coupler or a 1/2-inch round tip. Place the room temperature egg whites in the bowl of an electric mixer fitted with a whisk attachment. It is important that the bowl and whisk both be very ​clean, so that the egg whites whip properly. Begin beating the egg whites on medium speed. Once they are very frothy, stop the mixer and add the cream of tartar. Start the mixer again and continue to beat the egg whites. If you add the cream of tartar while the mixer is running, some might get splashed onto the sides of the mixer and won't be incorporated properly, possibly resulting in a bad taste or texture to your meringue. Once the egg whites form soft peaks, increase the speed to high and gradually add the sugar a little bit at a time. Beat the whites until they are very shiny and hold stiff peaks, but are not dry or crumbly. The egg whites should now be properly glossy and stiff. Now you are ready to pipe out your mushrooms stems and caps. Spoon the finished meringue into a large pastry bag fitted with a 1/2-inch round tip or the open end of a coupler. It doesn't matter exactly what you use, you just need the pastry bag to have a large circular opening. Cover a baking sheet with parchment paper. To pipe the mushroom caps, hold the pastry bag at a 90-degree angle about 1/2 an inch from the parchment paper. Using firm and even pressure, squeeze out a round meringue disc about 2 inches in diameter and 1 inch high. Stop squeezing, then twist the bag and lift it from the meringue to get a clean “break” from the cap. Repeat in regular intervals on the baking sheet until you have approximately 2 dozen mushroom caps. You can smooth out the tops of your mushrooms by wetting your index finger and lightly running it along the caps. Position the bag perpendicular about 1/2-inch from a second baking sheet covered with parchment paper. Begin squeezing the bag to form a 1-inch round base. Continue to squeeze as you slowly and evenly draw the bag up, forming a tapering stem about 1 1/2-inches tall. Try to keep the stems as straight and vertical as possible. Use all the remaining meringue to pipe as many stems as possible—some stems invariably tilt and collapse, so you should always make extras. Bake the meringues at 200 F for about 90 minutes, turning them halfway through the baking time to ensure even cooking. The meringues should be hard and dry to the touch and you should be able to easily lift one from the parchment. Once the meringues are done, turn off the oven and let them sit in the oven for several hours or overnight. 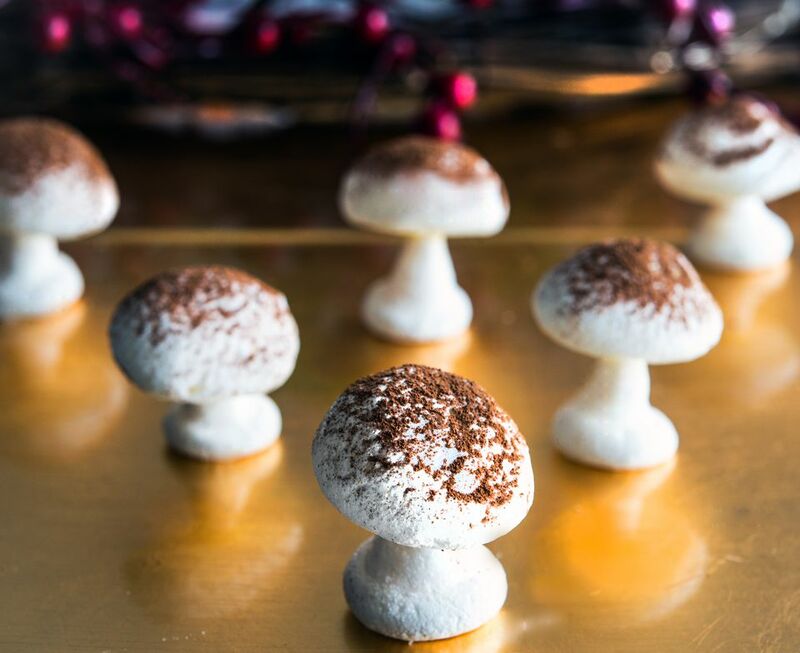 Once the meringue is baked and fully cooled, use a toothpick to carve a small hole in the bottom of a mushroom cap. Poke the toothpick into the center of the bottom of the cap, and rotate it several times to increase the size of the hole. You want the hole to be large enough to fit the tip of the mushroom stem, but not large enough to cause the cap to tilt or fall off the stem. Melt the white chocolate in a small bowl in the microwave, stirring after every 30 seconds to prevent overheating. Dip the top quarter-inch of a stem in the white chocolate and pipe a drop into the cap. Stick the chocolate-covered stem top in the hole of the mushroom cap. Place the mushroom on a baking tray to set and repeat with the remaining caps and stems. Place the cocoa powder in a sifter and lightly sift over the tops of the mushrooms for a realistic look. Note that humidity can make the mushroom soft and collapse, so do not place them on a cake or in a refrigerated environment until immediately before serving.